One of the capabilities we've built at Spingarage that I'm most proud of is the ability to show up at a hangar at the crack of dawn and have an air data boom ready to fly on an airplane we've never seen before by the time everyone's done sipping their coffee and checking the weather. I get a lot of questions about how this works, so I wanted to take a minute to explain the two pieces of the puzzle that make this possible. 1) The Conformal Mounting System: One of the first things we did when we built the first air data boom back in 2014 was invent a way to mount it to airplanes we didn't own. The first couple of mounts were airplane-specific, designed to mount on the strut of a Piper J-4 or a Cessna 175, but we quickly iterated to the adhesive mounts we've used on over a dozen different aircraft types for a wide variety of flight test operations. The mounts don't require modification of the airplane in any way, are quick to install and remove, and are conformal for compatibility with a wide variety of airfoil shapes. We clean the surface of the wing, apply a layer of aluminum tape, and then use double-sided adhesive to fasten the mounts themselves. Another application of aluminum anti-peel tape over the mounts finishes the install. We've flight tested our original prototype 5-hole probe to 245 KIAS using these mounts, and our larger, vane-style production Featherweight boom has been tested to 155 KIAS. "FAA Order 8110.37E, defines an alteration as 'a modification of an aircraft from one sound state to another sound state'. The use of suction cups, or other temporary methods of attachment (not including permanent mechanical attachments to the aircraft), would not be considered a modification to the aircraft. These temporary attachments would not be subject to the regulatory purview of 14 CFR part 43." In my view, aluminum tape is pretty unequivocally temporary. Since the Featherweight air data boom is very lightweight and doesn't typically have a significant impact on the structure or flying qualities of the aircraft it's installed upon, the boom as I see it isn't covered by part 43. The caveat of operating this way is that the install and operation of the boom is purely at the discretion of the operator, and anything bad that happens is the operator's fault. We don't use this as an excuse to be stupid about it. 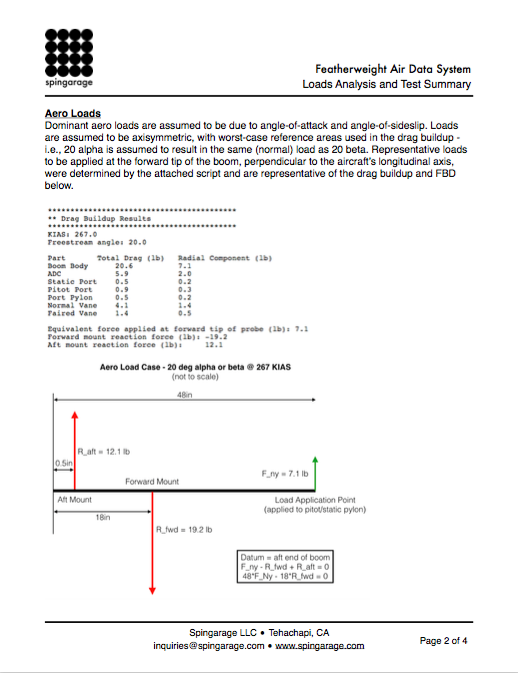 The above loads analysis uses a drag buildup and G-analysis to provide estimated equivalent loads for our target envelope with a 3x factor of safety, and load tests to failure have demonstrated that the mounts are capable. 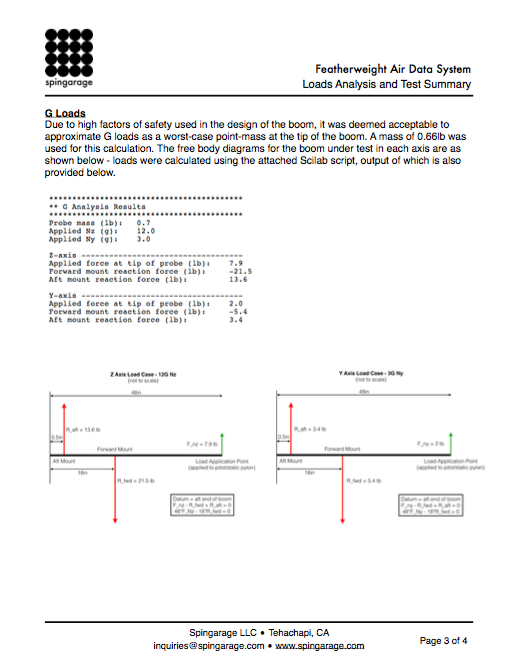 We load test every install prior to flight and we recommend that our customers do the same, and we've flight tested the boom throughout the target envelope. The ability to provide this service has led to working on some incredibly cool projects, from hot-rod Lancairs to beastly warbirds and everything in between, and I couldn't be more excited for what comes next.